Habituating is defined as a somatic, intimate, and transient means of understanding the world. This installation directly emerged from an investigation of intimation and knowledge activated through attentive participation. One 10’ wide DVD projection covers the back wall of the installation room. The projection consists of 10 four and a half minute video sequences and it loops, playing continuously with corresponding stereo soundtracks. Below the projection sit hundreds of glass jars, each is individually wrapped in a skin-like sheath of handmade paper, restraining its utilitarian function yet transforming it into a small drum. 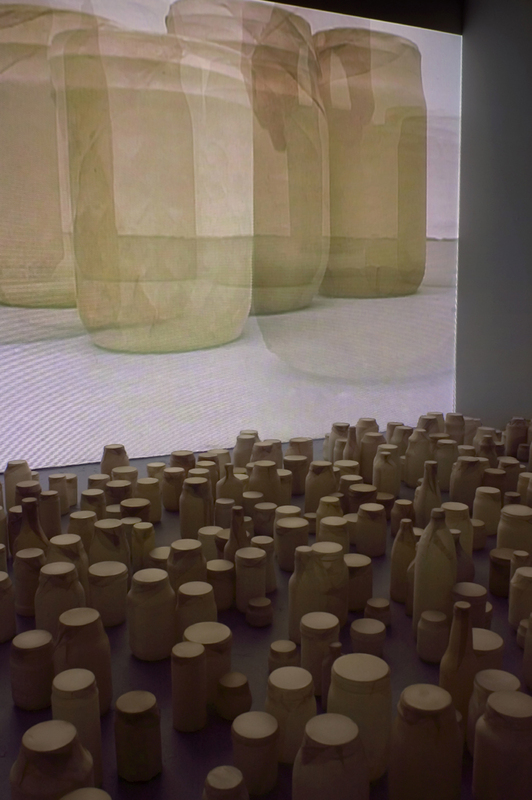 Each of Habituating’s 10 four-minute video sound sequences was created from the repetition and mimicry of a simple action—moving these paper encased jars into circles drawn on a cement floor and then one by one removing each container. I invited individuals to perform and then re-enacted each performance, habituating the pace and tempo of each previous player through repetition. The resulting recordings are increasingly layered just as drum and vocal parts are in an ensemble, each consecutive sequence containing one additional layer of audio and video. In this video/sound installation, I draw upon my experiences studying music in Ghana, West Africa, and with the Macalester College African Music Ensemble in Minnesota. Sowah Mensah, my primary mentor, repeatedly instructed our ensemble, “Do not think. Do not try to understand this music. Simply follow my hands, follow my lips.” Through these processes of mimicry and repetition, I learned to accumulate musical knowledge through a conscientious practice, a practice of intimation rather than note reading or intellectual comprehension. I am interested in how this approach challenges Western epistemology by preferencing intimate knowing gained through experience over publicly verifiable knowledge understood through the mind. This progression of video sequences builds at a slow yet consistent and methodical pace, challenging the viewer to invest their time with the work. The encompassing quality of the sounds, and their rhythmic references to inhalation and exhalation, whistling, and whispering inspire the viewers attention, drawing them into the increasingly complex layers of images and sounds. The placement, overlap, and interwoven network of movements seem to be constructed with no intellectually comprehensible system yet have an inherent structure that can be felt as the viewer participates with the work. It is this circumventing of the intellectual process and privileging of a bodily intelligence that I seek to create in the viewer experience. Like Fluxus work, this piece also highlights our interaction with everyday objects. My daily life in Ghana increased my awareness of the lifespan of our investment in disposable objects. I lived in Abaudi, an Ewe Community in the Adaklu Region. There, plastic water bottles were not only used to hold water, and as collecting containers for palm oil, but after functioning as a container they became a stick drum or a make shift timeline bell. I transform what would be a single use item in the States; by covering the discarded glass jars used in Weighting, I again give them a new use. Encased in abaca paper their new function is activated through intentional movement. What has been emptiness now becomes contained resonance. Habituating re-enlivens objects that are dis-empowered or silenced by their loss of function as well as by our own lack of awareness. 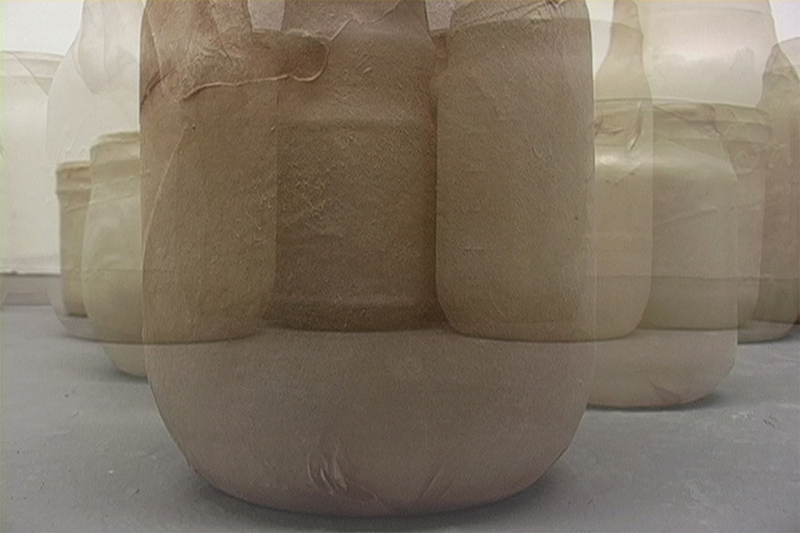 As the viewer grows intimately conscious of these jars, they also become aware of their relationship to these objects. This increased self-awareness is the seed for broader worldly connectedness. The silencing of these jars correlates to the systematic silencing of communities of people, such as many Ghanaian women who have found themselves financially paralyzed since the onset of colonialism. Some of these women from the Adaklu Region have begun using their traditional textile skills, particularly spinning, to tap the tourism industry as their means to financial independence. The re-voicing or re-enliving of these silenced containers references this emancipatory act. In this work, I am exploring how to effectively subvert Western notions of productivity by offering a route to somatic or intimately gained knowledge.